"Jobs are lifelines to Ohio's families. 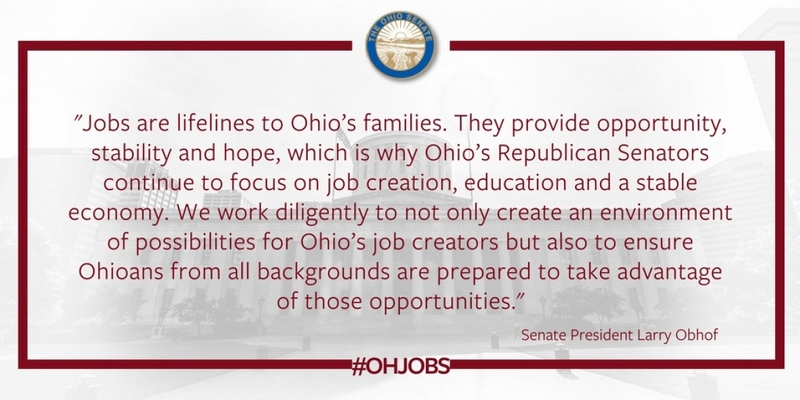 They provide opportunity, stability and hope, which is why Ohio's Republican Senators continue to focus on job creation, education and a stable economy. We work diligently to not only create an environment of possibilities for Ohio's job creators but also to ensure Ohioans from all backgrounds are prepared to take advantage of those opportunities. We've done this through creating a jobs-friendly business environment, developing a jobs-ready workforce and empowering Ohio's small businesses, the backbone of our economy. While this is an important milestone that shows Ohio's policies are working, we have much more to do, and we will continue to build on this progress."